A Life-Giving and Life-Changing Day! Without exaggeration, today was a life-giving experiences! Wow! 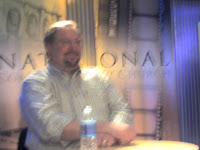 It was an unspeakable privilege to spend 2+ hours 10 feet from Rick Warren at a Pastors Event Forum in DC (in the basement of a coffeehouse). The guy is loaded with depth! He cranked out wisdom way faster than I could write. Let me give you an idea here. I brought 5 pieces of paper in case I wanted to take notes. I filled all 5 and the back of each. 10 pages of notes and then began writing up the sides. So, needless to say...I need to process this stuff while it is fresh. Learning requires something beyond just hearing. I need to write some of this out a lot more than you want to read it (I think)! I am going to do it a little different. I am going to do several mini-posts instead of 1 long post. Read the ones you wish. The separate entries will help me organize my thinking. Obviously, I learned more than I can ever compile here.